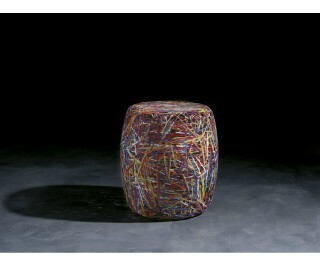 Pouf/stool. Partially made from recycled plastic. It is available in white or multicolour. Since 1997, Emporium has been combining ideas and designs to produce beautiful objects that surround us day in, day out. Our lighting solutions and complementary furnishings are conceived to evoke emotions and offer up an unequivocal feeling of wellbeing. POSITIVE DESIGN is very much the language of Emporium: a philosophy, an approach, a way of making the most of your environment through creativity. Emporium is the champion of a new concept of space – one that interprets our experience and promotes the culture of the extraordinary everyday. With EMPORIUM, design becomes accessible, the everyday becomes extraordinary, as we recast the concepts of light and space. Methacrylate, polycarbonate, wood and thermofused and recycled plastic materials take shape thanks to our creativity and experience. Light, essential, eco-sustainable design lies behind the complementary pieces of the LIVING series. Curvilinear and geometric shapes inspire the LUCELAB collection, evoking – in perfect EMPORIUM style – the shapes of the past, art and culture.